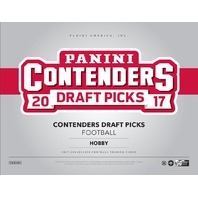 - A longtime standout in the Panini family, Contenders Draft Picks College Football returns in 2017 with autographs aplenty! 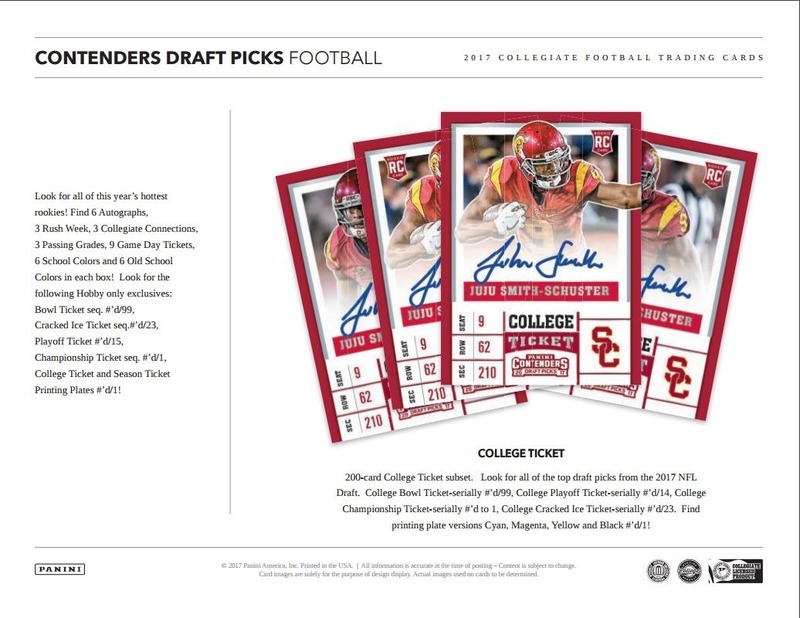 - The popular College Tickets subset features autographs from the 2017 NFL Draft and includes sequentially numbered Bowl Tickets, Playoff Tickets, Championship Tickets, Cracked Ice Tickets and Printing Plate parallels. 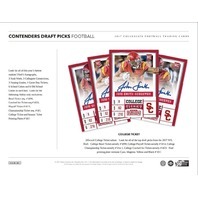 - Find rare autographs from college football legends in both Alumni Ink and Old School Colors Signatures. 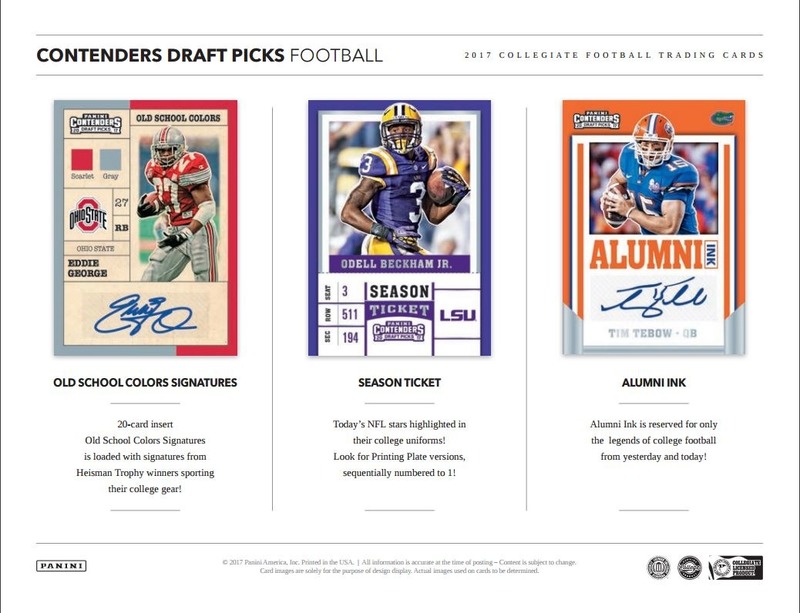 - Chase autograph inserts, such as Collegiate Connections Signatures, School Colors Signatures, Passing Grade Signatures, and Rush Week Signatures, featuring autographs from this year's deep running back class. 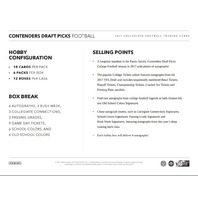 - Each hobby box will deliver 6 autographs! Today's NFL stars highlighted in their college uniforms! 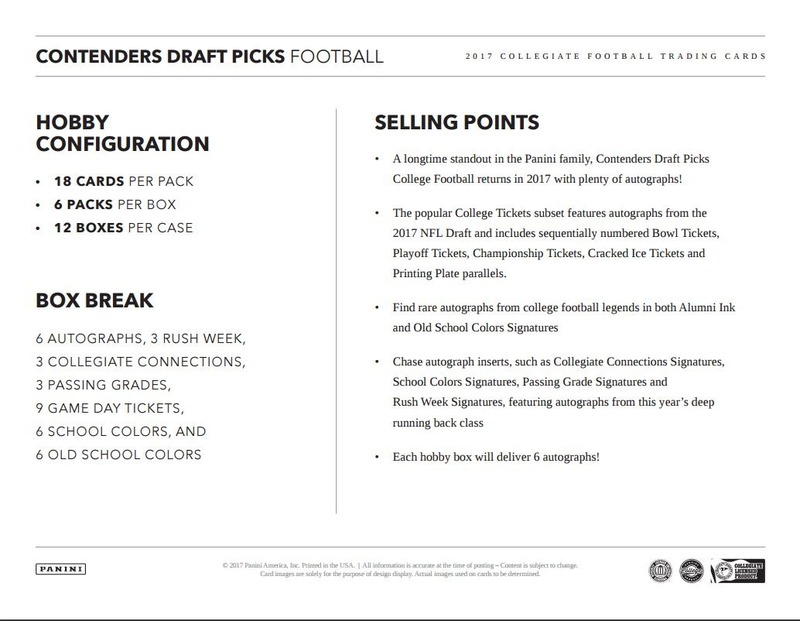 Look for Printing Plate versions, sequentially numbered to 1! Alumni Ink is reserved for only the legends of college football from yesterday and today! 200-card College Ticket subset. 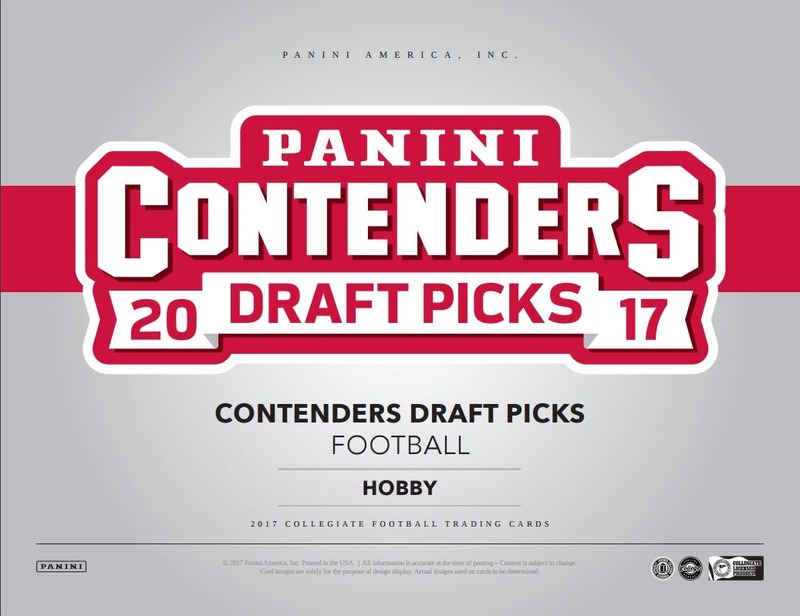 Look for all of the top draft picks from the 2017 NFL Draft. College Bowl Ticket-serially #'d/99, College Playoff Ticket-serially #'d/14, College Championship Ticket-serially #'d to 1, College Cracked Ice Ticket-serially #'d/23. Find printing plate versions Cyan, Magenta, Yellow and Black #'d/1! Look for all of this year's hottest rookies! Find 6 Autographs, 3 Rush Week, 3 Collegiate Connections, 3 Passing Grades, 9 Game Day Tickets, 6 School Colors and 6 Old School Colors in each box! Look for the following Hobby only exclusives: Bowl Ticket seq. #'d/99, Cracked Ice Ticket seq.#'d/23, Playoff Ticket #'d/15, Championship Ticket seq. #'d/1, College Ticket and Season Ticket Printing Plates #'d/1! Passing Grade Signatures is a fitting homage to the gunslingers who will carry the league into the next decade! 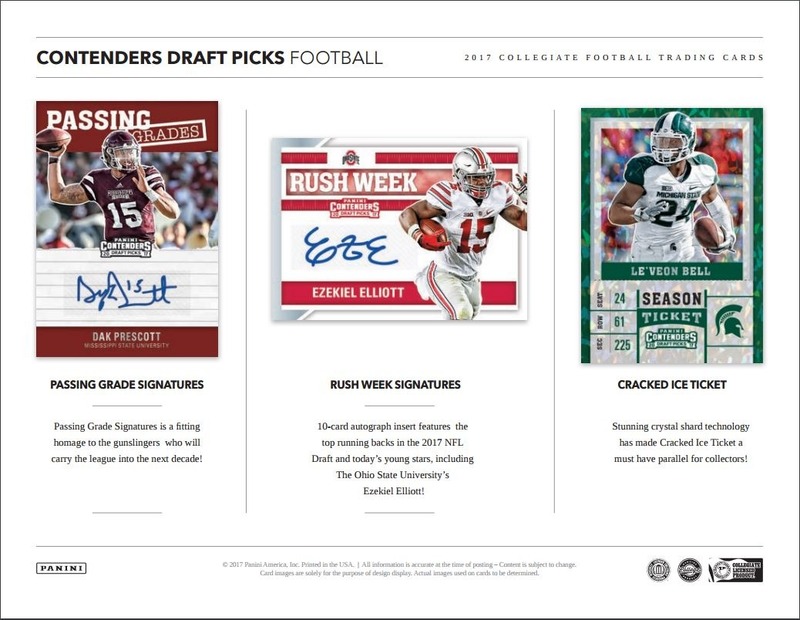 10-card autograph insert features the top running backs in the 2017 NFL Draft and today's young stars, including The Ohio State University's Ezekiel Elliott! Stunning crystal shard technology has made Cracked Ice Ticket a must have parallel for collectors!